If you are visiting Ireland, you are spoiled for choice when it comes to historic sites to visit. From Neolithic heritage sites such as Newgrange to the places where modern history unfolded as Ireland fought for freedom such as Dublin’s GPO and Kilmainham Gaol, you’re never far from a history lesson. But if you want a change of pace, Ireland is also home to a great many stunning gardens. It would be wrong to say these don’t have their own history. Indeed they do. While today they are relaxing places to stroll, enjoy a snack and shop for Irish gifts, most of them are what was once known as ‘big houses’. These were the properties of the elite. Ordinary Irish people only entered them as employees, as servants. So today there is a certain satisfaction in seeing them reclaimed by the public as recreational spots for everyone to visit and enjoy. Wicklow is known as the garden county, and they do have one of our most famous ‘big house’ gardens. But you will find more throughout the island. Here are four of the most delightful, each with a story behind it. Gardeners will find great inspiration. Maybe a green thumb is one of our less tangible Irish gifts along with storytelling and a good sense of humor. If you could only see one garden in Ireland, this would be the one. Powerscourt Estate just outside the village of Enniskerry in County Wicklow is one of the most celebrated gardens in the world. The 68-room mansion was built in 1741 for the first Viscount Powerscourt, who was eager to assert his status. The highlight of the stunning formal gardens is the splendid fountain in the lake framed by a pair of winged horses. The view from the series of Italianate terraces linking the house to the lake is delightful. The estate boasts a Japanese garden as well. This breath-taking Victorian mansion was built by the famous surgeon Mitchell Henry when he married his wife Margaret in 1867. The Benedictine order settled here in 1920, opening a school for girls and farming. It’s façade with the dramatic backdrop of sweeping, forested hillside graces postcards and assorted Irish gifts, but its walled garden is equally stunning. This award-winning garden covers about six acres, and at one point a team of 40 gardeners tended it. Today, only plants grown in the Victorian era grow here. One side if a formal flower garden with orderly paths and beautiful blooms, while the other is a more practical if equally organized vegetable plot. The midlands region is heating up as a tourist destination, and beautiful Birr Castle is one of the highlights. The castle itself has evolved greatly over the centuries. Built as an Anglo-Norman castle, the current structure includes the original gate tower. It has periods of neglect and multiple renovations and remodels, with the most recent significant changes made in the 1860s. It has housed a family of scientists, who in 1840 built a massive telescope. Today, it houses an innovative science center. And of course, it features bucolic gardens with long, winding paths to explore and an impressive collection of rare plants. 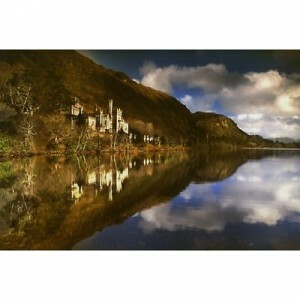 International and domestic visitors love Muckross House just outside of Killarney. It surprises no one that this gorgeous house was built for an artist, the watercolorist Mary Balfour Herbert and her husband. Touring the house and gardens will transport you back to the 1800s when it was built. You can also tour the traditional farm there, and see what life was like in much smaller houses. Our rich history is one of our real Irish gifts, and you can see it from different perspectives here and then enjoy a walk though the different gardens on the estate – the stream garden, the rock garden, and the sunken garden. These aren’t the only beautiful Irish gardens to see. You can find stunning gardens and old ‘big house’ estates in every county. But these four are the cream of the crop, and they each offer something different and magical.